Beckoned by the iconic “Follow Me” statue that stands before the entrance to the National Infantry Museum and Soldier Center, more than one million visitors have gone through the front doors and back in time to learn the stories of his fellow infantrymen. 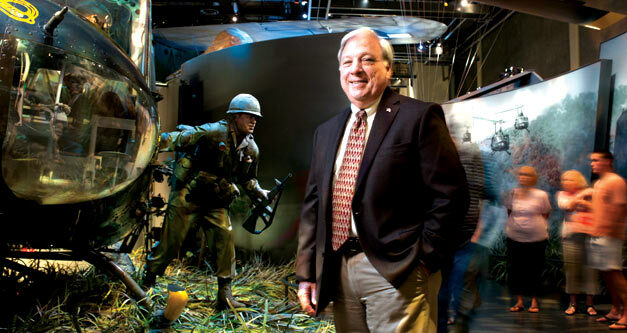 The signature exhibit in the three-year-old museum, which sits on the border between South Columbus and Fort Benning, is called “The Last 100 Yards.” Representing eight crucial battles from the Revolutionary War through the “Desert Wars,” including the landing at Omaha Beach on D-Day, the interactive diorama features life-size soldiers, authentic transports and sound effects like the rat-a-tat-tat of machine-gun fire. The $100-million museum has gone the whole nine yards to make itself a winning tourist attraction that is generating economic development in the area. “We’re not right on the beaten path to Florida, so we’ve been pleased with the turnout,” says Williams, whose museum won a coveted Thea Award from the Themed Entertain-ment Association in 2010 and pumps an estimated $50 million into the local economy. The interactive exhibits include a barking drill sergeant, a World War I trench with periscope, and a glass-enclosed recreation of a Vietnamese jungle that would feel too real if not for the red “exit” sign. A World War II-era company street with seven buildings, including one used by General George S. Patton, is on the grounds. The Army, which owns the artifacts, uses the museum as part of its history and heritage training. Graduations from Fort Benning’s infantry basic training, usually twice weekly, are held on the grounds on the parade field, which is technically post property, while the museum building itself is on land deeded by the city of Columbus. Thousands of family, friends and well-wishers attend the standing-room-only events. Williams says the foundation sold two acres of land to a private investor who plans to build a Hampton Inn by early 2013, and there has been an increase in restaurants in the area. The ribbon cutting for a mixed-use development called Patriot’s Walk was held in the spring. Future plans call for a $75-million National Armor and Cavalry Museum to be built near the infantry museum, and two tanks already mark the spot. In the meantime, the infantry museum has offered one of its huge galleries for a preview exhibit. The new museum is another offshoot of the move of The Armor School to Fort Benning as part of the Army’s Base Realignment and Closure (BRAC) process. Armor and infantry are now together in the U.S. Army Maneuver Center of Excellence. The move has brought approximately 9,000 new jobs to Fort Benning and a total regional population growth of about 22,000, including soldiers, Department of Defense civilians, defense contractors and families. BRAC’s completion in September 2011 means an additional annual impact of $1.65 billion, a huge increase over the $4.32 billion that Fort Benning was already bringing to the region, according to the chamber of commerce. Plus, $3.5 billion in construction, refurbishment and modernization of facilities is ongoing and includes plans for a new 75-bed hospital at a cost of $330 million and an 860-room lodge on the post that will cost $100 million. The current lodging will convert to administrative use, so as not to conflict with the lodging industry in Columbus. Jones says the economic development team is actively recruiting even more companies to enable spouses to find work. “We have anywhere from 3,000 to 3,500 men and women in uniform who annually depart the service through Fort Benning,” he says, “and we have estimates that about 70 percent of them like to stay in the region. These men and women departing the military have a good work ethic, they understand leadership, they understand management and sometimes a fact not recognized is they really understand technology. In late March, the Eagle & Phenix Dam was breached with military precision. About 1,500 people watched the destruction of the initial 50-foot section from the banks of the Chattahoochee. The explosion of a longer stretch four days later sent debris four stories high. The rapids will be Class III and Class IV, challenging enough for Columbus to bid for national and international competitions. The economic impact for the $23-million project is about $42 million, more than 700 jobs and an estimated 188,000 visitors per year. Tomlinson says the “Columbus Fall Line Trace,” a Rails-to-Trails project, has added another 12 or 13 miles to the 25 miles of Riverwalk. While all of this activity will help keep residents fitter, doctors are still a hot commodity, especially in Georgia, and they could come flooding in thanks to a partnership with Mercer University. In February, Mercer announced it will open a medical school campus in the city through a partnership with The Medical Center (part of the Columbus Regional Healthcare System) and St. Francis Hospital. Up to 80 third- and fourth-year medical students will be placed at the new campus. Students will begin clinical rotations in Columbus this summer. Gaymon also sees economic ramifications in having students familiar with Columbus. Mercer boasts a high percentage of graduates who have remained in Georgia or returned after completing residencies. Manufacturing continues to be a strong source of economic development activity in the region, thanks to the efforts of Becca Hardin, executive vice president for economic development at The Valley Partner-ship, a regional organization of the Greater Columbus Chamber of Commerce. In 2011, more than 1,000 primary jobs were created in conjunction with a capital investment of more than $165 million in the Valley region. The biggest announcement of 2011 was the expansion of Pratt & Whitney, creating 180 new manufacturing jobs in its engine overhaul facility along with a capital investment of about $20 million. That growth has prompted Hardin to place an enhanced focus on aviation, mainly repair and overhaul. In the first part of 2012, she says, she has seen a lot of activity involving suppliers looking to be closer to the Kia Motors plant in West Point, which employs more than 3,000 people. In Feb-ruary, Kia produced its 500,000th car. The economic development office has also started to work with NCR on its supplier network. “When you get large companies that are growing, logistically it makes sense to have their supply chain close to the main plant because of cost,” Hardin says. NCR announced in March that it would expand into a 100,000-square-foot building in Muscogee Technology Park, the area’s premier business park, adding 100 more jobs. Rick Marquardt, senior vice president for NCR Global Operations, says the partnership with Columbus has been “nothing short of fantastic” from the first day that he began scouting locations in 2009. Its first phase, in Corporate Ridge Park, has about 500 employees, and the second phase will bring NCR closer to its commitment of adding 872 total jobs. Expecting the defense industry to continue to ramp up in support of Fort Benning’s expansion, Hardin says a new business park just inside the main security gate of Fort Benning, called Benning Technology Park, is being developed. The 80-acre Class A office complex, which would house defense contractors to support the Maneuver Center of Excellence, should be ready in 2013. “Columbus has always been a thriving community,” Mayor Tomlinson says. “It’s always been a community where people were thinking innovative thoughts and pushing the envelope to do something new. I think you see [that] with the way we went after BRAC, the way we embraced it to maximize that opportunity, and the way we took advantage of the Rails-to-Trails and completed that.